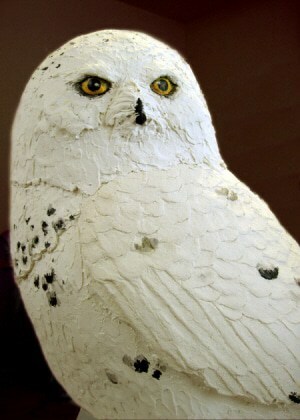 I posted the pattern for my paper mache clay snowy owl a few weeks ago, and in that post the video shows you how the armature was made. In today’s video, we add the paper mache clay and make the feathers, beak, and other details. 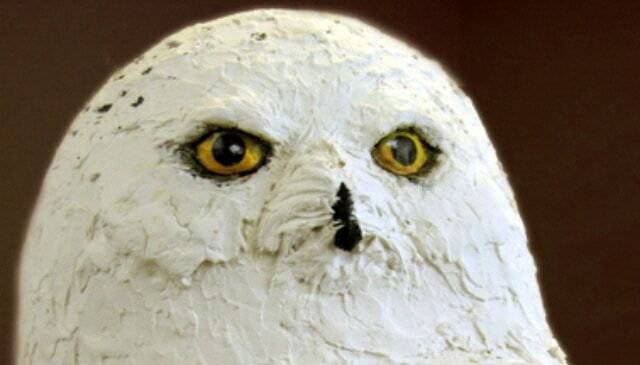 As I mention in the video, if I made another snowy owl I would use a thin base coat of the original pm clay, just like I did before. After that was dry and hard, I might add the details with the newer air dry clay recipe. I reformatted the Kindle version of Make Animal Sculptures with Paper Mache Clay, and dropped the price. Click the link to check it out. The air dry clay takes a lot longer, because it isn’t as sticky. That means that you have to fiddle around with a mixture of glue and water to make sure it stays where it belongs. You also have to make sure you don’t end up with gaps between pieces of clay when the sculpture dries. Because of the time factor, I’d probably use the original recipe for the back of the head and other places where there really isn’t strong definition of feathers, and use the air dry clay for the wings, back and tail. Both recipes use the same ingredients, with two exceptions — the air dry clay doesn’t have as much paper, so it probably isn’t quite as strong (although I’ve never done a scientific test) and the added corn starch makes it smoother, and takes away the stickiness. That’s a good thing if you want to get fine details, but it does slow things down. If you make a snowy owl, we would all love to see it. Love your video on smoother Air Dry clay; I watched it five times! I never worked with paper mache before but was searching for a recipe to make air dry paper clay. Has anyone tried adding glycerin to keep it from drying out as soon? Hi, Heather. I hope you’ll let us see the piece when it’s done, if your friend doesn’t mind. I’d love to see it. Thank you for feathering tips. It is amazing what you can do with a spoon or a butter knife. I frequently work on birds like Great Blue Herons that require a lot of feathering. I have found that I can use a heavy card stock to cut out my feathers. I apply the card stock to my base or even to my paper mache clay with a glue gun. Then on top of the card stock I apply the paper mache clay, or the air dried clay. Hi Kelly. Thanks for the tips. You do lovely work – I just went back through the comments and found a photo you gave us earlier of one of your Great Blue Herons. It was beautiful. I don’t suppose you would want to write up a guest post for us, showing us how you make them? I would love to see your process. And do you sell them anywhere, or have a website where we could see more of your work? I am very flattered. I am relatively new at paper mache but have been working with sculpture for many years. I developed a passion for paper mache sculptures when I owned galleries in Annapolis, Maryland. I told myself that I wanted to develop a product line of paper mache items if I ever left the gallery world. That is what I am working on right now. I do have a web site it is http://www.notyourmamaspapermache.com. I have recently moved to South Carolina and am exploring gallery options. For the most part, I have relied on participating in Sugarloaf Craft Shows in the Washington metropolitan area to sell my work. I would be happy to write a guest post some time in the near future. Currently, my husband and I are doing some renovations on our home. When I have a chance, I will write something and I will let you decide if you think it is appropriate. Hi Kelly. You have a nice website. I look forward to your guest post, whenever you have time. I’m sure it will be great. Hi Jonni, I purchased your How to make masks book on Amazon, and it arrived last week. I am not understanding about “wet-polishing”. When I polished the gesso wet it all wiped off. Can you explain please? Wait until the gesso is completely dry, and then use a very lightly damp sponge to go over the surface. If you still don’t get the result you want, use dry sandpaper and a mask. It’s a little messier, but many people do it that way if they want a really smooth surface. That’s how Basil made his super-smooth jackalope. You seem to have created a wonderful, creative and fulfilling life for yourself.. i’m sure you inspire many people in many different ways. Good for you! ?